Can’t make up your mind? Unsure about someone’s interests, size, or color preferences? Why not give the power of choice with a virtual gift card? 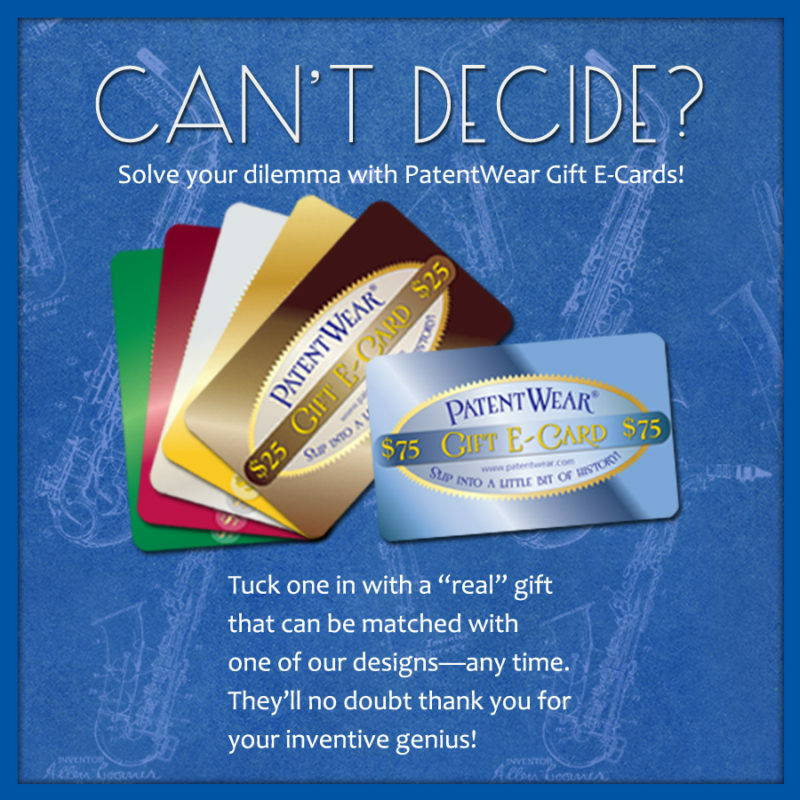 A PatentWear Gift E-Card is the perfect—and easiest—solution! You can even tuck one in with a “real” patented item you might give as a gift… they’ll thank you for such inventive genius no doubt! Since there is no expiration date, a PatentWear Gift E-Card can be used whenever the time is right. The perfect instant gift—you may choose any amount, and there is never a shipping charge or tax. When applied to an order, the Gift E-Card value is automatically subtracted from the total amount due during check-out. Pay with your VISA or MasterCard debit/credit card or via PayPal just as with any other PatentWear purchase. A unique Gift E-Card code will be sent to the email address associated with your order. Be sure any SPAM filters allow emails from orders@patentwear.com. We don’t want you to miss receiving your code! Please also note that no discount codes or coupons can be used for the purchase of Gift E-Cards, and Gift E-Cards cannot be redeemed for cash (except where required by law). The value of the Gift E-Card is tied to the code that was sent via email to the address associated with its initial order. When that code is redeemed, the value of the purchase is deducted from the Gift E-Card value. If an order total exceeds the value of a Gift E-Card, another payment method will be required to cover the balance. If the full value of the Gift E-Card is not used for an order, the remaining amount can be applied to a subsequent order once the redemption code is processed.